Wisdom Teeth – Should they stay or should they go? What should you do about your 3rd molars (wisdom teeth)? Nearly every teenager and adult has to face this question at some point. The quick answer is that as soon as they are developed enough to remove, then get them removed (typically some time between age 16 and 20). Each year you wait beyond that, you increase the chances of collateral damage. Once you reach your 30’s and beyond, you now have to weigh the pros and cons much more closely as you just don’t heal as well as you once did. Anthropologists who have studied this have given some interesting insights. Thousands of years ago, our diet was much more coarse and so teeth would not only wear down on the tops, but in between the teeth as well. This would have created more space in the mouth for all the teeth to fit. Also, life spans were shorter and so some of the end stage diseases (like periodontal disease) that we see with wisdom teeth now may not have happened because people didn’t live long enough. Finally, over the years there has been more scrambling of the genetic code as small people with smaller teeth and jaws marry bigger people with bigger teeth and jaws, you begin to get more variability and randomness in the amount of space people have available for the size of teeth in their mouths. How do you know if you can keep your wisdom teeth? ke a panoramic x-ray that will show the wisdom teeth, what angle they are coming in, and how developed they are. Many of the wisdom teeth do have enough room to come, but they don’t have enough room to have the type of gums around them (keratinized gingiva) that will create a good long term seal around the backs of them. It is more like your cheek tissue is running right up against the back of the tooth. 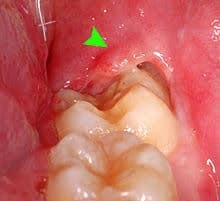 This will eventually be the weak link where gum disease and bone loss begins. 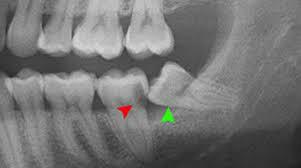 Other wisdom teeth may be at an angle where they won’t be able to come in all the way (impacted). These can cause damage to the back side of your good molars (2nd molars) that you do want to keep. food lingers back there causing cavities and gum problems. Most of your chewing takes place in front of these teeth. Studies have shown that less than 2% of adults with wisdom teeth at age 65 and beyond are able to maintain them without cavities or gum disease. What’s the best timing for removing wisdom teeth? Most dental surgeons prefer to wait until the roots of the wisdom teeth are at least one third developed (typically between age 16 and 20) because it is easier to get a hold of them for removal. As you wait longer than that, the roots continue to get longer and more matured and can approach an important nerve in the lower jaw that you don’t want to damage. So, sooner is usually better. How hard is going to be to have wisdom teeth removed? Most people are nervous about removing their wisdom teeth because they are afraid of pain or the cost. Recovery is going to be different for everyone. It is really case by case. It is best to visit with your dental surgeon to let them discuss with you your specific situation and the risks and benefits involved. If you generally recover fairly quickly from illnesses, then this will likely apply to this surgery. You may want to take advantage of modern medicine and be sedated so that you are not aware of what is going on. For most people, a combination of over the counter pain relievers will be prescribed by your dental surgeon to keep you comfortable for a few days along with a softer food diet.